Yesterday, the baby handed me a book to read to her. 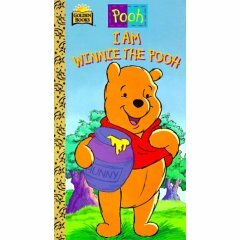 It was I am Winnie the Pooh, a golden book that basically introduces kids to Winnie the Pooh and his friends in the Hundred Acre Wood. I was really surprised because I had not even remembered that we managed to hold onto that book. The book had Al’s name in it (since it was his first) and let’s just say it has racked up plenty of miles in its nine year journey with us. I saw the remnants of sticky spots (you know, when the paper still manages to have spotting though the fruit, biter biscuit, or other snack food in question has been removed after an overenthusiastic toddler has grabbed the book with snack hands), clear tape used to put pages in place (and I must say that it was pretty good tape work, because I had to look twice for it). If nothing else can be said, that book was thoroughly loved. I had to smile because so many things have to be replaced when you are dealing with active boys (at least with mine), it’s nice to see some things in decent and usable condition that survived their first years from time to time. It is hard to believe that January is almost over…. Did you hear that Christopher Robin is being replaced by a girl? I did not hear about them changing Christopher Robin’s character into a girl, Brotha Buck. They could have left him alone. I’m glad you liked it, Glory.